One step closer to being ready for the Arizona Trail. I received a brand-new map set on CD of the entire 800+ miles of trail on Friday. The maps are 1:28,000 scale and each image prints on an 8.5x11 sheet. These maps are very detailed and should be perfect for navigating. 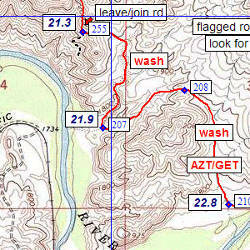 The AZT Association at aztrail.org has overview maps which are great for getting familiar with the trail, but not detailed enough for navigating. Now that I have these maps and my compass, my navigation needs are met. Printing front and back gives me 65 sheets to carry - that's almost a pound of paper! I plan to carry about a week's worth of maps at a time and ship the rest ahead in a bounce box. Every day, I hope to cover 3 pages of maps which is around 20 miles. I'll mark spots where I take pictures or other interesting bits and then dump the used pages back in the bouncebox at the next resupply point. These maps were created by, and being sold by ($25), Brett Tucker at simblissity.net but the profits go right to the AZ Trail Assocation for sustaining the trail. Brett has done an excellent job on an extremely useful project to benefit the hiking community.